The annotation shows the relationship that the two significant peaks at 3.745 and 5.424 when combined as a linear superposition are equivalent to an amplitude modulation of 4.431 and 24.196 year periods. The central frequency is also present in the power spectrum indicating something approaching 100% modulation and confirming the amplitude modulation relationship is a correct interpretation. The central frequency is exactly half the lunar periapsis period of 8.85 years. Such a frequency doubling is typical of celestial influences in the tropics. This is seen in the solar insolation which reaches a peak twice per year as the sun passes over the equator twice a year. It shows similar peaks with some slight deviations in some values. In particular the modulation frequency is closer to 28.5 years (this derived value is very sensitive to errors or differences in the spectrum ) and 1.817 is found to peak at 1.68 years. 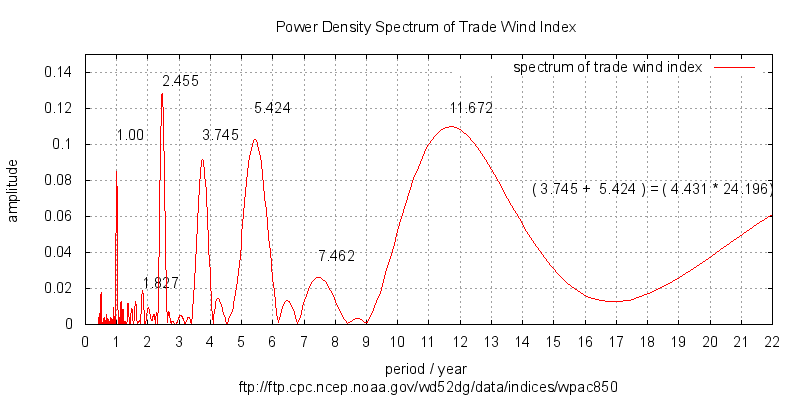 It can be argued that the square of wind speed , being related to the power in the wind is a more appropriate metric for studying relationships with other climate variables since interchanges are governed by energy transfer.